The National Survey on Drug Use and Health found that nine percent of U.S. adults between the ages of 50 and 64, and three percent of adults 65+ have used marijuana within the survey year. While it’s no surprise that baby boomers, who grew up in a notoriously weed-friendly culture, are using marijuana regularly again; it’s the senior set who is making a case for using medical marijuana for pain relief. Seniors are among the fastest growing demographics using medical marijuana, growing 250 percent from 2006 to 2013. With legality increasing nationwide, more people are turning to it as a natural alternative to pain killers, sleep aids, and to increase appetite. 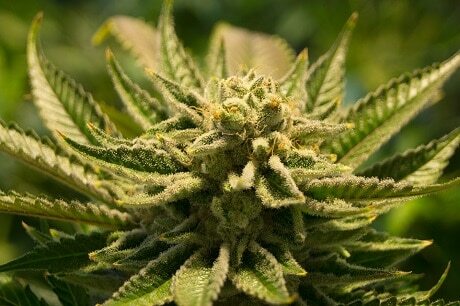 As cannabis becomes more commonplace in the United States, researchers are finding more medicinal effects of the plant. How is Medical Marijuana Different? Unlike pot, medical marijuana comes from a pure, uncut cannabis plant (“street weed” can contain other substances.) While marijuana contains more than 100 chemicals called cannabinoids, the two that have been identified by scientists with specific medical benefits are delta-9-tetrahydrocannabinol (THC) and cannabidiol (CBD). These chemicals bind to the body’s CB1 and CB2 receptors—part of the endocannabinoid system that promotes regularity across all major body systems to ensure they work harmoniously with one another. CB1 receptors live in the brain and other areas of the central nervous system, along with organs such as the digestive tract, liver, lungs, kidneys, and eyes. CB2 receptors live in tissues related to immune function like white blood cells, tonsils, the thymus (a lymphoid organ) and the spleen. Some CB2 receptors have preliminarily reduced pain equal to the effects of morphine without narcotics, feeling high, or side effects that could be detrimental to seniors like falls, confusion, seizures or hallucinations. Why is this important? THC and CBD have different effects. THC is the ingredient that provides the high feeling or sense of euphoria. CBD has been found to have many healing effects for pain management and reducing inflammation, making it a popular alternative for seniors with arthritis or general pain. Medical marijuana is used to treat symptoms for a variety of conditions. Studies have shown that marijuana helps with nausea and vomiting caused by chemotherapy and can help patients regain their appetite. In a 2014 study, specialists at St. George’s at the University of London found that using cannabis alongside radiation therapy for brain cancer patients drastically slowed the growth of tumors. Multiple studies have shown that THC promotes the removal of amyloid beta protein clumps in the brain, which is commonly believed to be the starting point of Alzheimer’s disease. Research shows THC slows the formation and progression of plaques on the brain and stops the inflammatory response from the nerve cells. Other studies have shown that marijuana can help manage some of the behavioral symptoms like agitation and aggression, which could be beneficial to both the person with Alzheimer’s/dementia and their caregiver. Clinical trials investigating how marijuana works with Parkinson’s disease have shown decreased symptoms of psychosis, REM behavior sleep disorder, tremors, and patients noted a better quality of life. While more seniors are flocking to medical marijuana dispensaries to try this new method of medicating, it’s not without trepidation. Many seniors fear getting high no matter what delivery method they use. CBD doesn’t cause the euphoric effects THC does, making it safer for those who don’t want to experience that side effect. Only when CBD combines with THC will you experience feeling stoned. CBD lotions, salves, balms and oils are becoming popular with baby boomers and older people alike as a natural solution for inflammation and pain. If derived from a hemp plant rather than a marijuana plant, CBD is federally legal, making it a new, trendy ingredient in a lot of mainstream products sold at major national stores like Whole Foods and Sephora. CBD’s calming effect has proven to be helpful for a variety of disorders, including generalized anxiety and depression. Many seniors have found it helpful in situational anxiety and depression brought on by major life changes. The medical industry is working to make CBD a legitimate medication. In June 2018 the Food and Drug Administration approved Epidolex, the first prescription medication containing CBD to treat epilepsy. While medical marijuana and CBD infused products are proving to provide relief for a variety of ailments, using it in a medical capacity is not without its challenges. Marijuana is still illegal on a federal level. Since the impact of the drug varies from person to person, it’s difficult to dose. As with other medications, marijuana may not react well with your other prescription medications. Medical marijuana may not be right for every senior, but medical use has been found to be effective. Look into your state’s laws and consult your physician about options. Aegis Living has specific policies to work with each resident’s physician to approach medical marijuana in a safe and effective way by having route, dose, and reason for the medication provided with a prescription. This article and its author are not providing specific medical advice, but rather provide reader with general information to better understand the use of cannabis products by seniors. Readers should consult with a qualified physician for diagnosis and for answers to your personal questions.